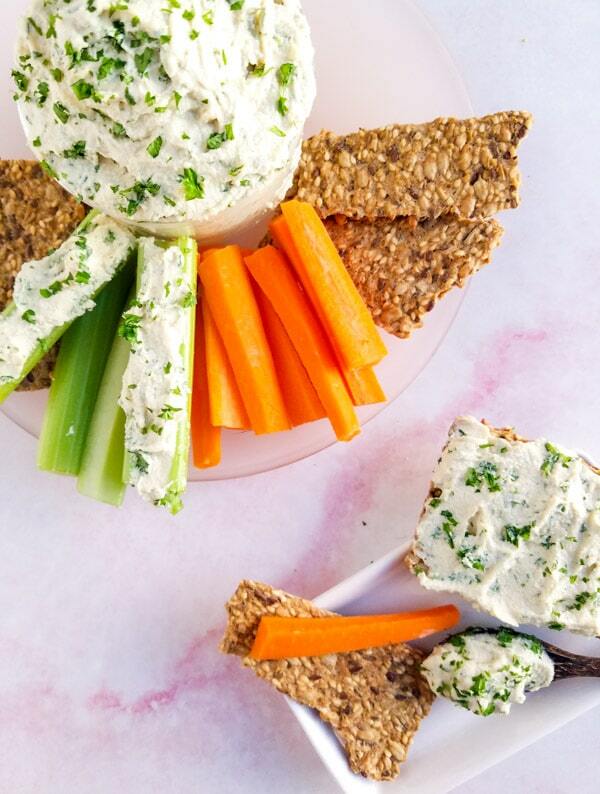 Savory roasted garlic cashew cream cheese is a vegan treat. 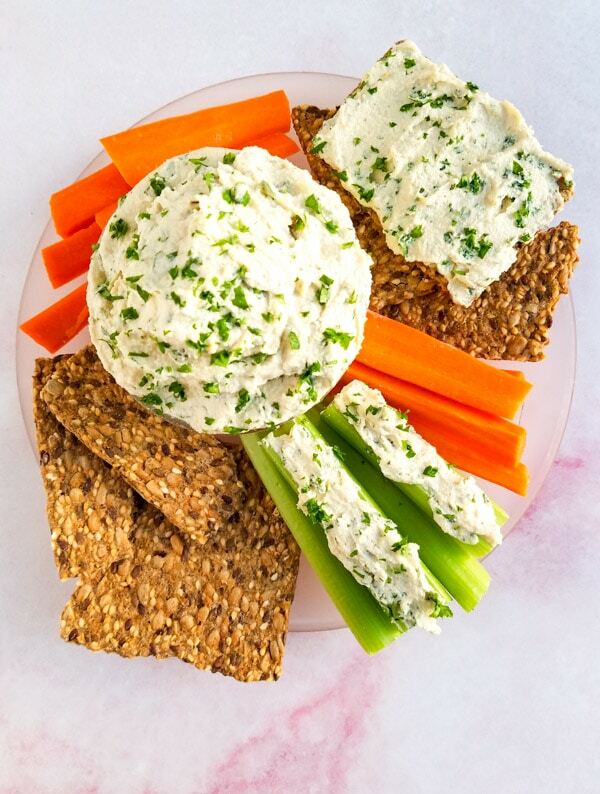 Spreadable, savory, and perfect on a bagel, crackers or as a dip for carrots and celery. Add fresh herbs like parsley or chives for your own twist. We have been wanting to experiment with dairy-free and vegan cheese making. 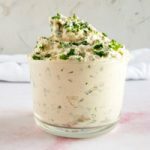 I first saw this vegan blue cheese recipe over on Full of Plants. This site has a few aged and smoked vegan cheeses that I just can’t wait to try. But our past dairy-free cheese making attempts did not fare well. Before trying again I thought I would try my hand with a basic cashew cheese that didn’t require aging. After a few attempts I got my perfect cashew cream cheese consistency, but it needed a little something. I had several heads of roasted garlic leftover from our roasted garlic post. And a very yummy, and VERY garlicky, roasted garlic cream cheese was born. Or cream cheez if that is your thing. Like any cheese, vegan or not, the hands-on time for this recipe is minimal but it does require a little preplanning before serving to ensure you have enough time to soak the cashews, roast the garlic and allow time for the cream cheese to chill. Start by soak cashews in water for 12 hours. This makes them soft and makes the blending easier. While the cashews are soaking you will need to roast the garlic if you haven’t already done so. Our roasted garlic post has all the details covered. After draining the cashews, place all the ingredients in your food processor. Pulse a few times to break up the cashews and garlic. Blend on high until smooth. Scrapping down the sides, as needed. Add additional water 1 tablespoon at a time, if needed, to gain a smooth lump free texture. 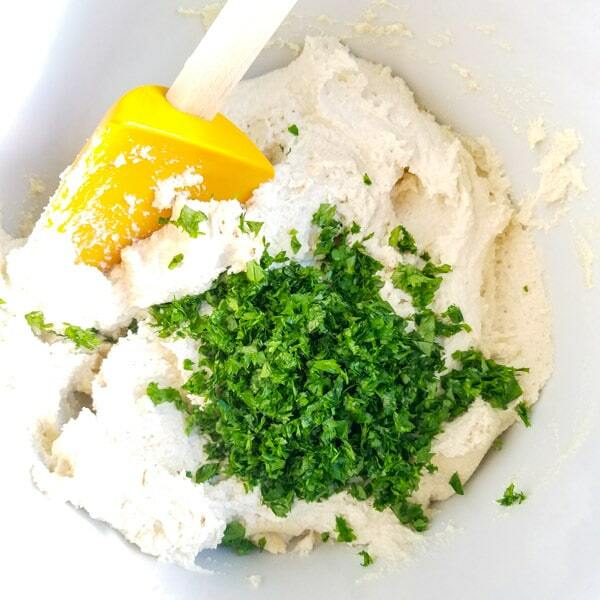 If you are using fresh herbs to jazz up your cream cheese stir them in by hand at the end. Putting fresh herbs in the food processor Season to taste with additional nutritional yeast. Chill for 4 hours prior to using. Cover and store in the refrigerator for up to a week. 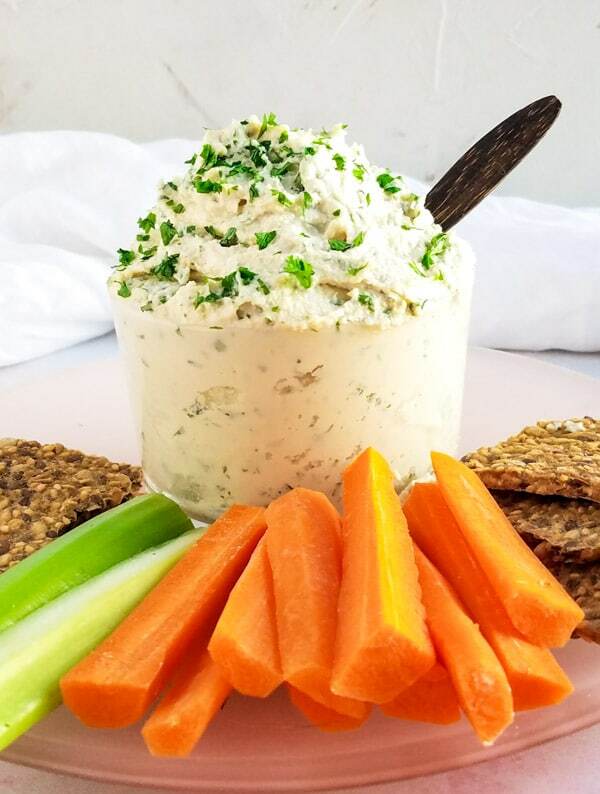 Spreadable roasted garlic vegan cream cheese. 1/4 cup fresh herbs, chopped (optional) parsley, chives etc. Place cashews in a bowl and cover with cool water. Soak for 12 hours. Drain and rinse. 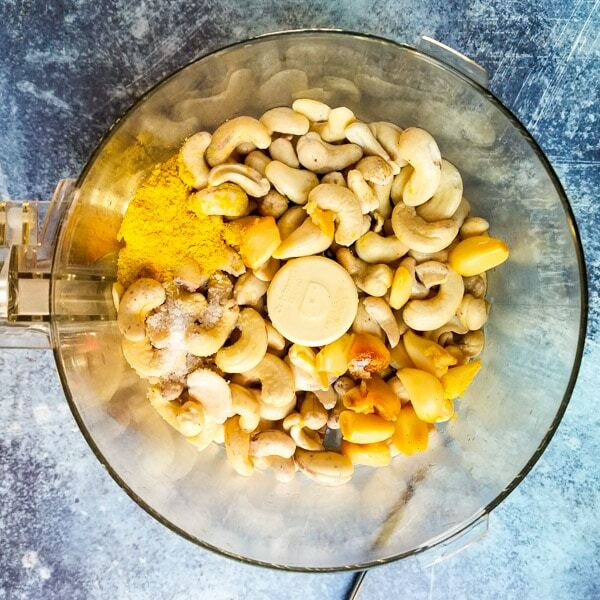 Add cashews to a food processor with the roasted garlic, water, lemon juice, 1 tbsp nutritional yeast, and salt. Pulse to break up the cashews and garlic. Blend until smooth. Scrapping down the sides, as needed. Add additional water 1 tablespoon at a time, if needed, to gain a smooth lump free texture. Season to taste with additional nutritional yeast. If you are adding fresh herbs, stir them in by hand. Cover and store in the refrigerator. Chill for 4 hours prior to using. I love appetizers and anything with cheese is a winner in my book … I love the addition of garlic and cashews to this mix. Well where the heck have I been. 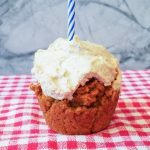 I’ve never heard of cashew cream cheese although we simply love cashew nuts — what’s not to love about those delicious nuts? Anyway, add roasted garlic into the mix and I imagine it makes quite a tasty cheese ball sans cheese. Would love to be dipping some veggies into it right now. 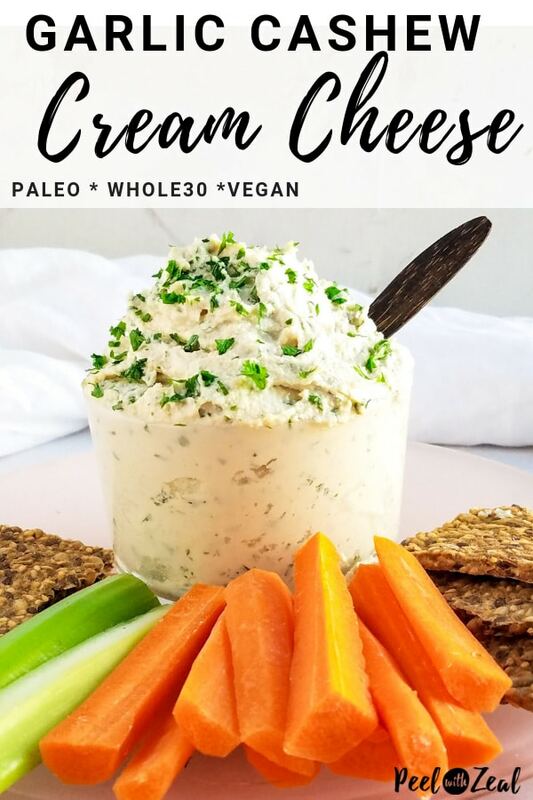 I am so intrigued by vegan cheeses! 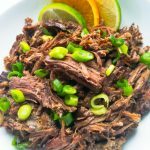 I think my favorite kind are the ones made with cashews and adding roasted garlic in the mix? That sounds like a cheese I’d want, vegan or not! You had me at garlic. I’m such a lover of garlic and dips, so this recipe will most certainly be added to my list of recipes to make for the holidays. Such a great way to feed everyone without singling out the vegans and vegetarians at our holiday get togethers! I can tell by its lovely texture that we are going to be besties…cant wait to put this in/with/on/?under? ALL THE THINGS.